This is post 4 in the 5-part series, The Right Tools for the Job: Re-Hosting DigitalGov Search to a Dynamic Infrastructure Environment. This post references the previous posts frequently, so please read those before reading this one if you haven’t done so already. In addition to the DNS challenges created by offering “masked” domains such as nasasearch.nasa.gov, we also had to solve the problem of how to maintain SSL certificates for the main search.usa.gov domain along with the “masked” domains of all customers that wanted HTTPS support for their own domains. As also noted in an earlier post, this all needed to be done in a multi-app-server environment with no interruption of service. Let’s Encrypt offers an automated process for obtaining and renewing SSL certificates — including SAN SSL certificates for up to 100 domains — as long as you can prove to them that you control any domain that’s included in a requested certificate. Given that we wanted to be able to quickly offer HTTPS support to new or existing “masked” domain customers, this automation seemed very promising. The fact that Let’s Encrypt is a free service made it all the more compelling. So we set ourselves about the task of making sure we could always prove our ownership of the search.usa.gov domain as well as “masked” customer domains while keeping the site available for customer use at all times. Since we cannot create DNS records for our customers’ “masked” domains and it’s not easy even to publish search.usa.gov DNS records, that left HTTP as the only Domain Validation option for us. Our goal then was to make sure we could have the Let’s Encrypt agent create web resources as needed to respond to any HTTP challenge issued by the CA. We chose EFF’s Certbot and followed their straightforward installation instructions. Certbot has options that will instruct it to attempt to install newly acquired SSL certificates in an Apache or Nginx setup, but we chose to use the certonly mode of operation which tells Certbot simply to store the new certificates in an output directory. We use this in conjunction with the –webroot option which tells Certbot that it will be writing files somewhere underneath the webserver’s document root so that they can be publicly available via HTTP requests. 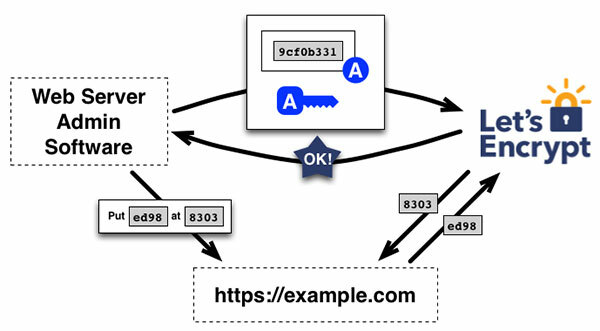 Roughly following the Domain Validation example in the Let’s Encrypt documentation, the process of fulfilling this certificate request would complete the two steps illustrated in these diagrams for each domain. This reduces the convoluted many-party, multi-step process to one that involves only three parties. Since one of these parties, Let’s Encrypt, is automated, this reduces the entire process time from weeks to minutes. This process works great in a single-server environment because all HTTP requests issued by the CA go to the one host where Certbot is running. But as our service operates in a multi-server environment with various hosts sitting behind an Elastic Load Balancer, you’ll immediately see a problem. There’s no guarantee that an HTTP request issued by the CA will be served by the same host that’s running Certbot. Also, since our site needs to remain up and running at all times, we can’t simply send all traffic to one Certbot-controlled server for the duration of the domain validation process. We need to be able to serve content to our users and serve domain validation responses to Let’s Encrypt at the same time. This guarantees that Domain Validation requests go to our Certbot host and all other traffic goes to our pool of application servers. We set up all our proxy EC2 application servers with these special blocks as well as all of the application servers in the old hosting environment (not shown in the diagram). So whether the Let’s Encrypt CA issues a Domain Validation request for a domain that was still being handled by the old hosting environment or a domain that was being handled by the new AWS hosting environment, we were guaranteed that the request would eventually get proxied to the host that’s running Certbot. At the time of this writing, Certbot is still in its infancy, and installing it varies across environments. The first time you run Certbot, be prepared for the wrapper script to install dependencies on your system. SAN SSL certificates are valid for any domain listed within their Subject Alternative Name field, but they also have a primary domain name listed in their Common Name field. Let’s Encrypt will use the first domain listed in your request as the Common Name field. Our convention is to always list search.usa.gov as the first domain name in the requested list and then provide the rest of the domain names in alphabetical order. That way the Common Name on our certificate is always search.usa.gov instead of whichever customer domain happens to be first alphabetically. If you issue too many certificate requests to Let’s Encrypt, you’ll find yourself receiving rate-limiting error messages. To avoid being rate limited, use Certbot’s –staging option, which instructs it to use the Let’s Encrypt staging CA. 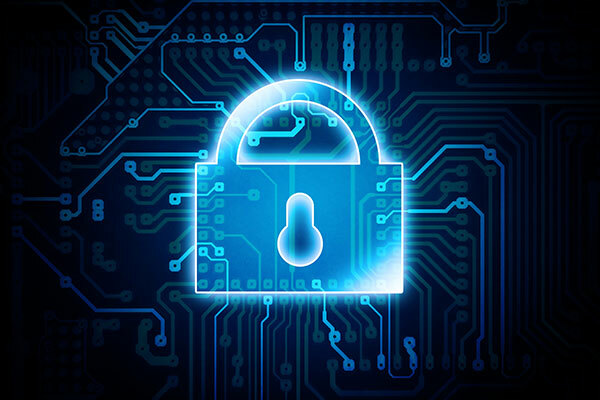 Our HTTP Domain Validation request proxy design ensures we can quickly and easily generate a new SAN SSL certificate that is valid for all of our customers’ domains. It currently takes us only a few minutes to respond to customer requests for HTTPS support as long as they have their DNS set up properly. This combined with the free cost of the Let’s Encrypt service makes it a great solution for us.